The Costa del Sol - "Sunny Coast" or more literally, "Coast of the Sun") is a region in the south of Spain, in the autonomous community of Andalusia, comprising the coastal towns and communities along the Mediterranean coastline of the Province of Málaga. The Costa del Sol is situated between two lesser known costas: Costa de la Luz and Costa Tropical. Formerly made up only of a series of small, quiet fishing settlements, the region has been completely transformed during the latter part of the 20th century into a tourist destination of world renown. 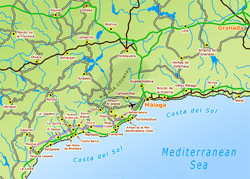 It includes the city of Málaga and the towns of Torremolinos, Benalmádena, Fuengirola, Mijas, Marbella, San Pedro de Alcántara, Estepona, Manilva, Casares, Rincón de la Victoria, Vélez-Málaga, Nerja, Frigiliana and Torrox. 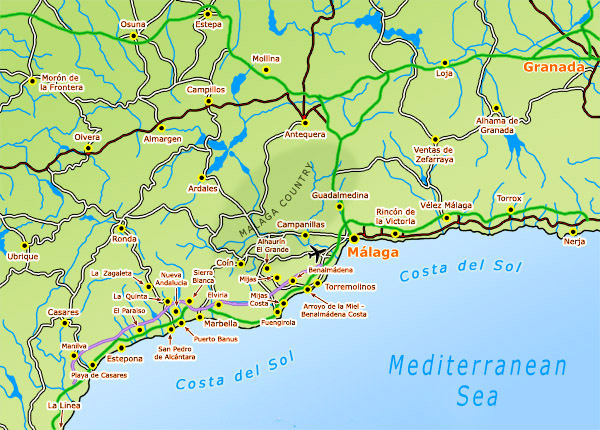 The Costa del Sol extends from the cliffs at Maro in the East to Punto Chullera in the west. Settlement in the region dates back to the Bronze Age, and has been colonised and ruled by many cultures such as the Phoenicians, Greeks, Carthaginians, Romans, Vandals, Visigoths and Moors, before the Reconquista. The Costa del Sol is a popular tourist region that welcomes millions of people annually, who mostly arrive at Málaga Airport and head to one of the many resorts located along this stretch of coastline from Manilva in the west to Nerja in the east. The Costa del Sol has a pleasant climate, with an average annual temperature of 19 ° C and more than 300 days of sunshine. It has a wide range of hotels and apartments, both on sea and in the countryside, many golf courses, zoos and attractions, conference centers and marinas. The Costa del Sol is also known as the Costa del Golf. It has the highest concentration of golf courses in Andalucia and the European continent.